Jen, a Senior at UMass came to visit with me recently. She comes to Newman for many reasons… first and foremost is to reflect Our Lady Seat of Wisdom Chapel. She not only enjoys the quiet and solitude but she needs it especially at the end of a long and trying day of classes and working four jobs. She juggles a lot – she has to in order to stay on top of her academic standing and make enough money to support herself and pay her tuition. You know the stories – you hear them constantly. This is the reason why the Chapel is an integral part of the Newman experience. Students reflect, celebrate Mass, confess, receive the Sacraments and are reminded of their parish church. These are the joys that are experienced every day by so many. But, with joys come challenges and these must now be our focus. In order to accomplish these efforts I humbly ask for your help in this Campaign with a request of a gift payable over 18 months in the amount of $5,000, $3,000 or $1,000. For your review, I have included in this packet additional information about each of the projects so that your consideration of my financial request is made with the most and accurate of data. Also, included are the specifics in terms of donor recognition regarding each of the levels of giving. Thank you for considering a donation to our capital campaign. 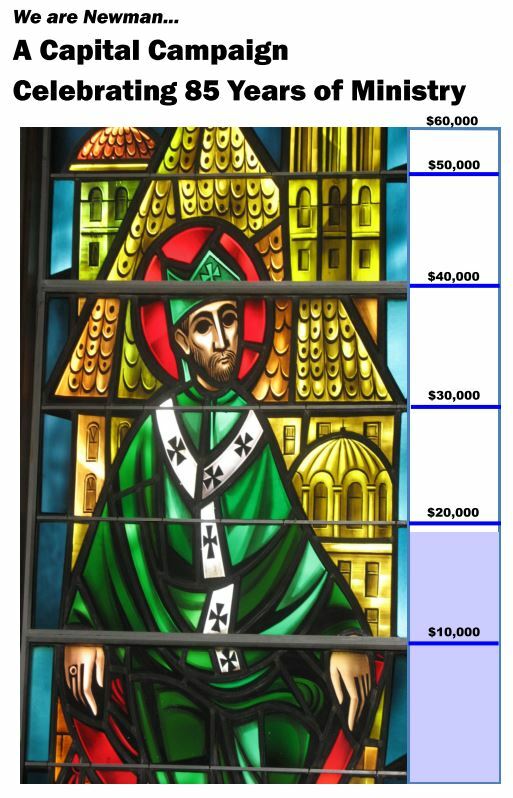 Your support of the Newman Catholic Center has been remarkable and it is because of you and your sustained commitment that we are able to celebrate this important milestone and continue our vital and essential ministry.